Women Who Wrote Hollywood - Citizen Jane Unbound! This year we’re pleased to partner with Citizen Jane to present a book discussion about WHEN WOMEN WROTE HOLLYWOOD, a collection of 23 new essays that focuses on the lives of female screenwriters of Golden Age Hollywood. These women's work helped create some of the most unforgettable stories and characters beloved by audiences, but their names have been left out of most film histories. The contributors trace the careers of such writers as Anita Loos, Adela Rogers St. Johns, Lillian Hellman, Gene Gauntier, Eve Unsell and Ida May Park, and explore themes of their writing in classics like Gentlemen Prefer Blondes, Ben Hur, and It's a Wonderful Life. The conversation will take place at Columbia’s new independent bookstore, Skylark Bookshop, at 1:00 p.m. on Saturday, November 3. 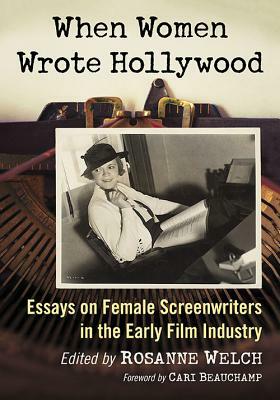 Nine of the authors whose work appears in this collection will read from their work and discuss the role of women writers in the early days of film. It promises to be a fascinating discussion. Books will be available for purchase and signing after the event. This event is free to the public and does not require a ticket or pass to the Citizen Jane Film Festival. Older PostAnd... our Kids Keynote is Jacqueline Woodson!